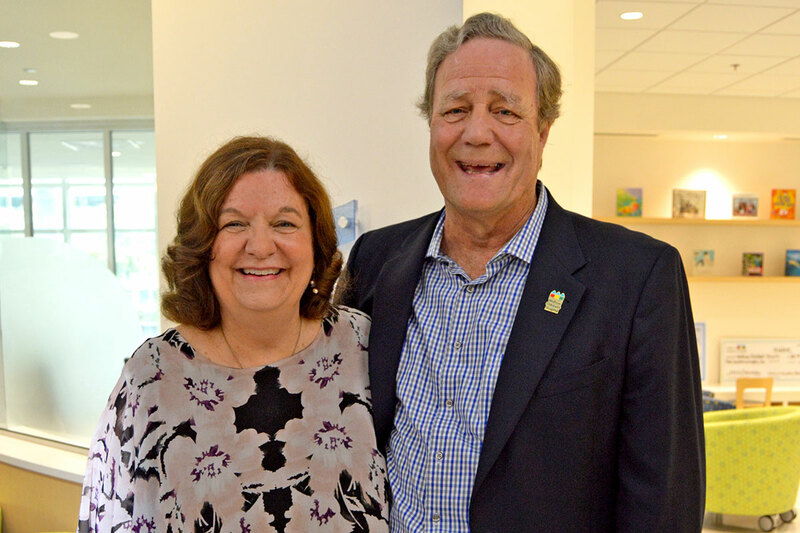 Baptist Health friends and family gather for time capsule opening - The Resident Community News Group, Inc. | The Resident Community News Group, Inc.
On Nov. 5, 2018, when top brass at Baptist Health and Wolfson Children’s Hospital opened a time capsule that had been buried during the dedication of the pediatric hospital’s patient care tower a quarter of a century ago, it was as much as celebration of Wolfson’s progress as it was a family reunion. 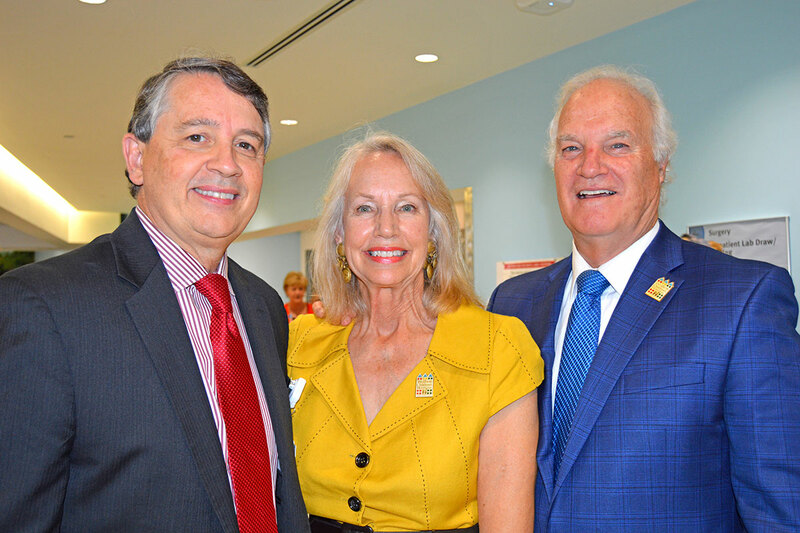 Baptist Health and Wolfson Children’s Hospital leaders, hospital board members, donors, physicians and nurses, past and present, were on hand to witness the unveiling of items retrieved from the time capsule, which had been buried in the sidewalk in front of the children’s hospital. 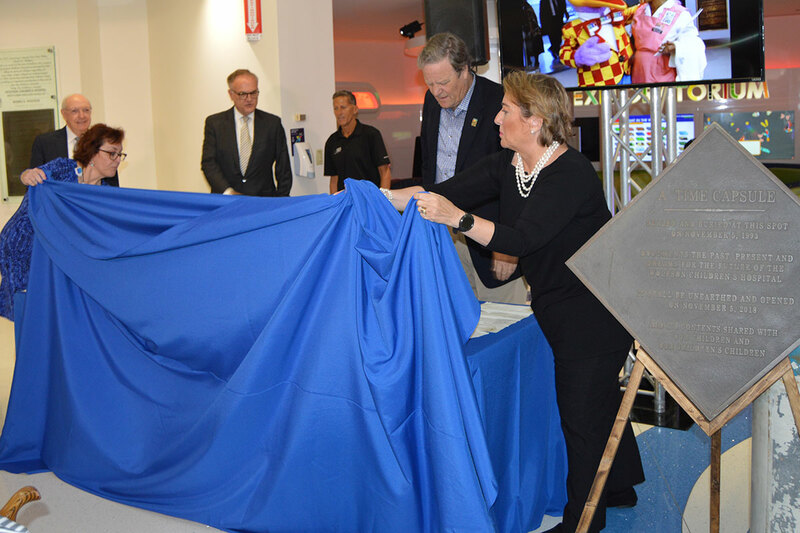 Due to a threat of bad weather, the unveiling took place in the Wolfson lobby. Seen within the crowd were Larry Freeman, retired Wolfson Children’s Hospital President and his wife, Chris; Dr. George Armstrong, retired Wolfson chief medical officer and his wife, Kaye; Carolyn Johnson, retired vice president of Wolfson Patient Care Services; members of the Wolfson family – Jeffrey Wolfson and Karen and Don Wolfson; Linda Wilkinson, an ardent donor and wife of the late Dr. Albert Wilkinson, Jr., one of the founders of Wolfson Children’s Hospital and Nemours Children’s Specialty Care; former Wolfson Board Chairmen Skip Frantz and Ellis Zahra; T. O’Neal Douglas and his wife, Alice; Bill Mason, retired president and CEO of Baptist Health and his wife, Julie, former vice president of the Baptist Health Foundation and leader of the Gift of our Children Capital Campaign; Women’s Board President Beth Langley and President-elect Katherine Forrester; former Women’s Board Presidents Susan Smathers and her husband, Bruce, and Kaye Glover; Past Wolfson Children’s Hospital Auxiliary President Margie Kalil; and pediatricians Dr. Warner Webb, Dr. Dennis Lafer, Dr. Ken Horn, and Dr. Gary Soud. Unveiling items in the time capsule were Baptist Health Director of Public Relations Cindy Hamilton and Vikki Mioduszewski, manager of marketing and communications for Wolfson Children’s Hospital. 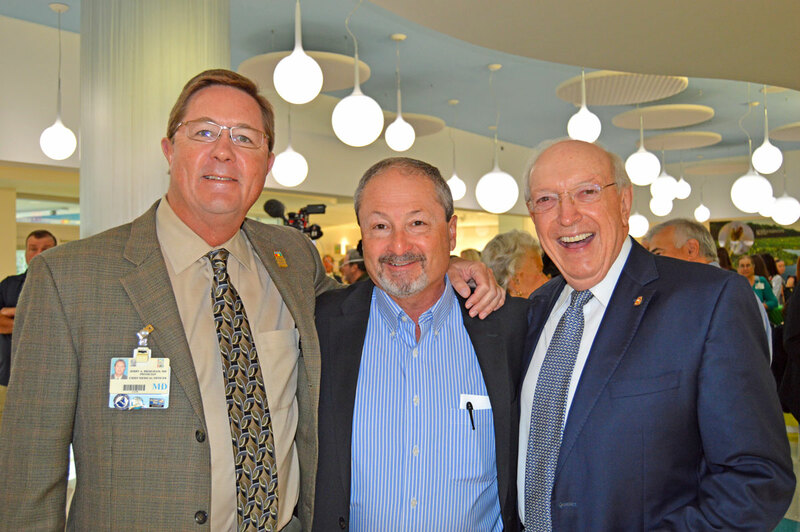 Former Baptist Health President and CEO Bill Mason, Baptist Health President and CEO Hugh Greene and former Wolfson Children’s Hospital President Larry Freeman look on. 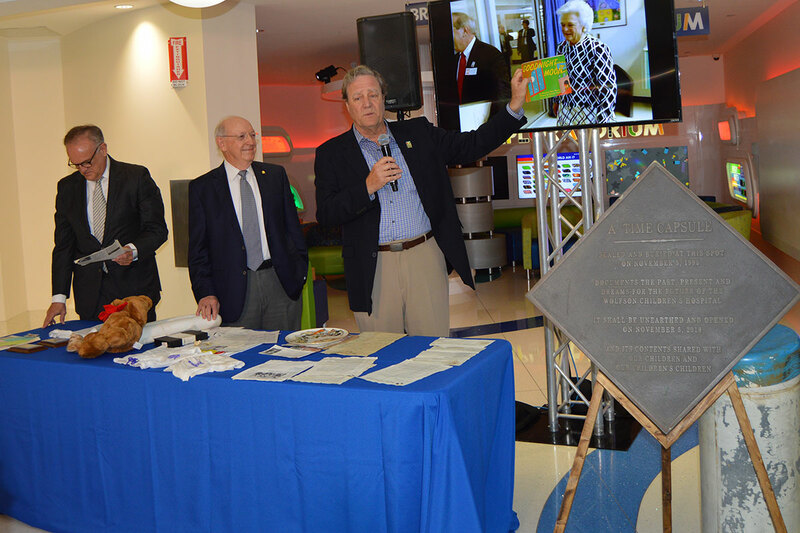 As Baptist Health President and CEO Hugh Greene and former Baptist Health President and CEO Bill Mason look on, Larry Freeman holds up a children’s book signed by former First Lady Barbara Bush, during the unveiling of a time capsule at Wolfson Children’s Hospital Nov. 5. Bush read to Wolfson patients from the book when she attended the hospital’s dedication 25 years ago. Baptist Health President and CEO Hugh Greene addresses the crowd during the unveiling of the Wolfson Children’s Hospital time capsule. 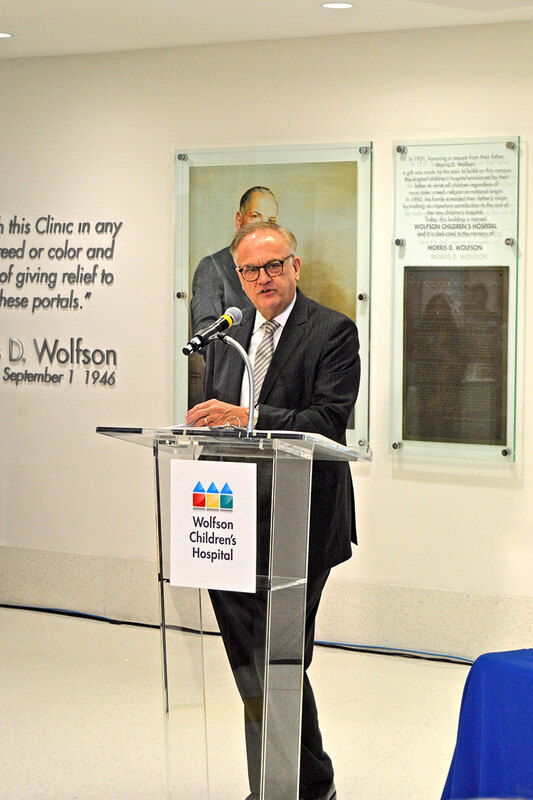 Although Wolfson Children’s Hospital President Michael Aubin was unable to attend, Wolfson’s Chief Medical Officer Jerry Bridgham addressed the crowd and was one of several Baptist Health notables, including Chief Operating Officer John Wilbanks, Chief Medical Officer Dr. Keith Stein, Chief Nursing Officer Dr. Diane Raines, and Chief Financial Officer Scott Wooten. “I’ve been feeling nostalgic with this event,” said Freeman before the contents of the time capsule were unveiled. “I been feeling really nervous. I’ve been retired for eight years and coming back and seeing all these people is really something. Unfortunately, once the time capsule was opened, many of the items within it were soggy. During the presentation Greene, Mason, and Freeman highlighted several items including an NICU baby onesie, an “Inside Track,” the employee newsletter, a groundbreaking shovel lapel pin, a “Gift for Our Children” brochure, the book “Goodnight Moon” that had been signed and read to Wolfson patients by Barbara Bush before the time capsule was buried, and a commemorative Boehm plate, donated by Helen Boehm from the first fundraiser held by the Women’s Board. 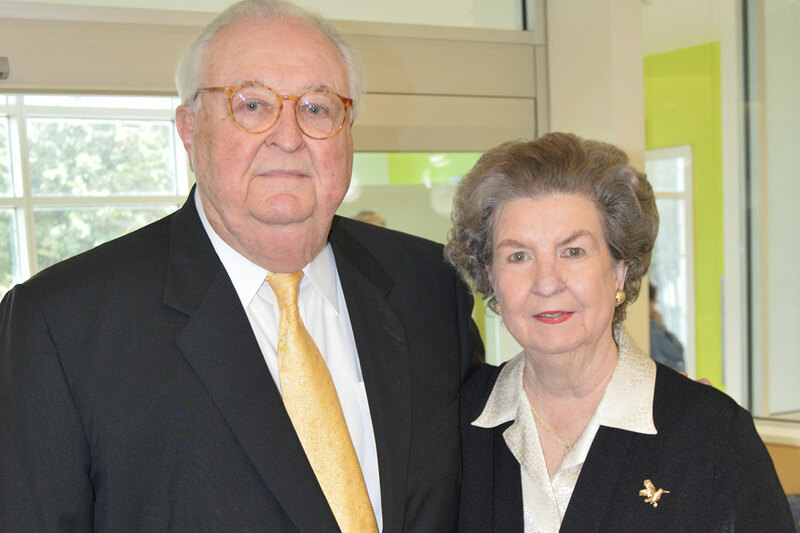 During his remarks, Greene said it seemed like yesterday that Baptist Health held the dedication ceremony for the then-new $45 million, 220,000-square-foot, 90-bed patient tower that also included Jacksonville’s first and only pediatric bone marrow transplant unit. 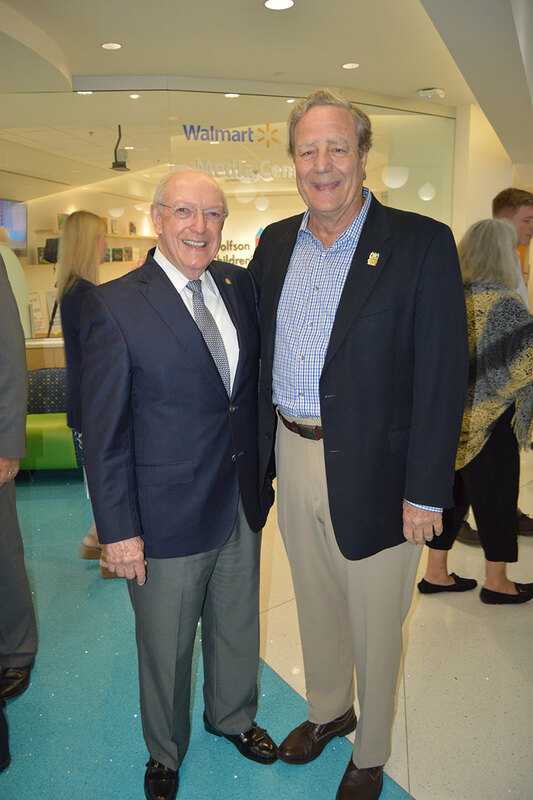 During the following 25 years he said Wolfson has expanded greatly to include the University of Florida Pediatric Cardiovascular Program in 1996 and Kids’ Walk, the skyway connecting Wolfson and Nemours, which was dedicated in memory of Mason’s late son, Stephen, in 1997. Other Wolfson highlights over the past 25 years that he mentioned include the creation by Wolfson and Nemours of the Northeast Florida Pediatric Diabetes Center in 2000; Safe Kids Northeast Florida, a childhood injury prevention program in 2003; the Lucy Gooding Children’s Neurosurgery Center, which was established with the UF College of Medicine – Jacksonville in 2005, which was also Wolfson’s 50th anniversary; a new 250,000-square-foot joint patient tower, known as the J. Wayne and Delores Barr Weaver Tower, which opened in 2012; Wolfson’s first pediatric outpatient specialty center in Lake City in 2012; and Wolfson’s state designation as a pediatric trauma center in 2018.